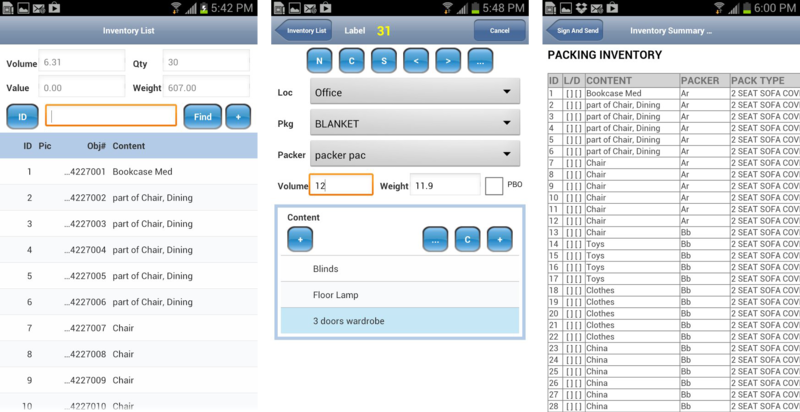 Inventory is a mobile packing inventory recording and printing application that runs on iPhone, iPad and Android phones and tablets. Click to view sample packing inventory. Packing inventory details can be uploaded to the office right after receiving transferee's signature. Sending the packing list to the office over the Internet right from the shippers house helps speed up the paperwork for expedited shipments. Inventory app supports extermely fast camera based scanning which practically eliminates the need for hardware scanners. Print packing inventory in any language directly from any iOS device using Bluetooth or wi-fi to any mobile document printer using AirPrint adaptor. Upload packing list summary, details photos and signature to customers and office staff directly from the device via HTTP, email and Dropbox. Enter article names in any language, then print off the packing inventory in the desired language using built-in translation.